I hate to use mouse traps, but can't afford an exterminator. It's not unusual for mice to invade a home and especially in the colder winter months. When you're lying awake at night and you hear the scampering in the walls or ceiling, you'll know you have unwanted house guests. And yes, I kill them. Sorry, but that is the only way to rid them from my home. At first I bought a plug in sonic sound machine, that supposedly would drive them out, but they stayed. I bought traps that would catch them and not kill them, but they easily escaped from those. I tried to be nice and it did not work. Even the cleanest of homes can have mice. Having cats may not solve the problem either. I have two cats, and one of them actually came nose to nose with the mouse, then turned and walked away! An exterminator will cost money, and that is enough reason for me to get rid of mice myself. Traps don't include any types of poison and the animal is killed quickly. I hate killing animals, but the consequences of letting them have free roam is frightening. How Do You Know If You Have a Mouse Problem? I recently moved into a home that had been abandoned for about a year. It needed, and still needs, some fixing up so I wasn't really surprised to find that mice had taken up residence. After talking with other people, I found that most everyone has had a mouse problem at some point, although many people are in denial, or don't want to admit it. New England homes tend to be older and less energy efficient, and mice can fit through the tiniest of cracks and holes. In fact it only takes a space of a quarter of an inch for a mouse to squeeze through! Some people think that only slobs with dirty houses have mice, but the truth is that anyone can have them. I feed the birds and birdseed does seem to attract rodents so be careful of what you have outside in your yard. They will make themselves known either by the noises they make, or the droppings they leave, or both. They may even scurry across the kitchen floor and you'll catch a glimpse out of the corner of your eye. 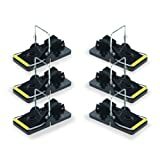 I ended up killing seven mice using the Snap-E traps. 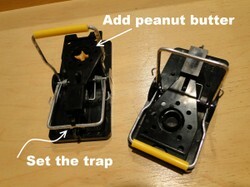 I used peanut butter and first set traps in the kitchen where the mice were often hanging out. One drawer, that held pot-holders and no food, had droppings in it, so I cleaned it out and added two traps there. I caught two mice in the drawer over night. I caught three more over the course of a couple days and than all was quiet. I thought they were gone for good but then there was more scampering and scratching in the walls so I added three traps to the basement. I had two dead mice the next day and have not had any more trouble since then. But, I don't doubt that I'll have to continue to wage war since my house is old and needs fixing up in many places. At least now I know how to address the mouse problem immediately. In fact I still have a couple of traps set, just in case. I find the Kness Snap-E mouse traps to be most humane. They instantly snap the mouse's neck when it goes to grab the bait. There are other types of traps, and I haven't tried them all, but some I never would. Glueing a mouse to a sticky paper is not humane. The cheap wooden mouse traps did not work for me. Often parts of the mouse would get caught and it would be alive still and suffering. I have also tried a noise maker that plugs into the light socket and supposedly repels mice. That didn't work at all. This is the best mouse trap I've used. What to Use For Bait? I found these ideas in the comments at Amazon, where buyers had had success. It's pretty easy to get mice to "bite". If you are wondering which bait will work best, it may be up to the taste preference to the mice in your area. I used peanut butter, but you could use cheese, other nut butters, bird seed, cream cheese, and oats. They probably eat a lot of other things too. If you know mice are around, but they are not attracted within a few days, maybe try something different. It's also a good idea to NOT feed birds in summer, or fill feeders too quickly in Fall, as the seeds will bring rodents into the yard and they may view your home as a good place to take up residence for winter! You need more than one mouse trap. You will need more than one mouse trap so you can cover a range of places the mice may be traveling. I have to set my traps up high, away from my cats, and sometimes when they go off they will fall to the ground. After that, they may not work as well. Also, I will warn you that after the first use, these traps are harder to set. You may want to go with new traps for each use. Ever had a mouse problem in your house, car or any other place? They will make nests in campers, boats, and just about any place that is dry and warm during bad weather. They may be cute, but they are not welcome houseguests. Mice can be so cute. There are many varieties of mice and you may think it's cruel to snap their necks. I do too, but it's all I've found that will work. They can carry disease and cause people to become sick who come in contact with their droppings. They could be scurrying around your kitchen counter tops and you wouldn't know it. One morning there was one hiding in the back of my coffee machine. My cat had jumped up on the counter and was staring intently at the coffee maker. That is how I knew. Before I began trapping them, I had to clean every surface of my kitchen counters in the morning because I didn't know if mice had been there the night before. They are destructive and will chew holes in all kinds of things. Plus they may chew wiring. Mouse droppings can cause serious illness if they carry the Hantavirus. A female mouse can have 10 litters of babies in one years time. And those babies can start having babies after they are two months old! They can climb and jump and they will get into your home through the smallest of openings. My cats merely chased the mice around until they got lost somewhere in the house. I do love animals, but I look at it this way: They belong in their natural habitat and when they invade mine, and make a nuisance of themselves, something has to be done. I really don't want to kill little animals that are just trying to stay warm over winter. I kept hoping they would leave on their own (ya, right), but they had settled in nicely and were making their way around through the framing inside the walls and ceiling. They would come out at night and I'd wake to hear the cats running around which I knew meant they were playing chase-the-mouse. What fun! Then they would lose the mouse in a heating duct and that would be it- until next time. (Male cats are better at this killing thing I think) When I caught one of my cats in the kitchen staring a mouse down - and then walking away - I knew I had to be the one to take care of the problem. I would find droppings amongst the cans in my cupboards and some little mouse had fun eating a bunch of the butter-flavored Crisco in the baking cabinet. How cute! Little mouse parties all night long. And when they had full tummies, they would sit in the walls and scratch like mad. Really - it was loud! The local shop had no traps I liked the looks of, so I shopped online at Amazon for a good mouse trap. The Snap-E had hundreds of good reviews and someone had even sent in photos of their traps with dead mice in them. I immediately bought four of them. This package contains 4 bait trays. 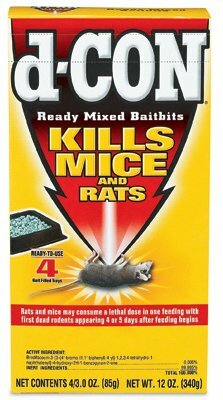 This poison causes the mice to die within 3-6 days according to the product description at Amazon. I have a wedge of d-Con mouse poison behind the pullout drawer under my stove. I was hesitant to use poison because I was afraid the mice would die in my walls and stink. I haven't noticed that happen. I think the mice were getting into my house through the weak siding on the back of the house. I would see them in the kitchen and in one cabinet in particular. So I bought a wedge of d-Con and set it behind the oven where the cats couldn't get to it. Setting and placing these traps can be tricky. Once the lever is set, the slightest rattle can cause it to snap! Fill it with the bait and then set it. Carefully set it down in the desired location, and then leave it alone. Take pets and children into consideration when placing the traps. You will want to make sure the traps can't be accessed by anything larger than the mouse! Mice live in the walls of buildings, and they navigate the space either along the outside of the walls (in the room) or inside them. If you have an idea of how they are getting in, place traps near openings. Even if you hear them in the wall, they will come out at some point, and hopefully check out your traps. Personally, I believe in using traps inside only. My way of thinking is that outdoors is their territory. If they stay out of my house, I am happy. Live and let live. The mice will travel along the boards in the walls and ceilings so set the traps near those areas if you can. This is a photo of one I put up high in my basement. Mouse trap high on the floor joists in the basement. Find a safe place to set your traps that is out of reach for kids, cats and dogs. It's quick. I could not bring myself to get a photo of the dead things, but I caught quite a few within days. The Snap-E mousetrap works basically the same way as the old wooden traps, except that it is sturdy and easy to set. It is also very easy to release the dead mouse. I set the traps at night when mice liked to come out and party. To release the dead mouse just push on the metal bar and they drop into the trash. Setting them is easy, but first you must find a safe place to place them. If you have children or pets placing the traps in a hidden spot is a must. These things could do some damage if they snapped a finger or paw. Remember that cats can climb and are nosy creatures so just putting a trap up high may not be enough to keep kitty from harm. Find a place that the mice frequent and set your traps there or as close as possible. Look for droppings, or listen for scratching. A basement or attic is a good place, or an attached garage, but make sure it's a place where cats can't climb onto, if you have them. I put traps on the supports in my basement and in one kitchen drawer where I constantly saw droppings. EDIT: It is sometimes difficult to re-use these traps. They are easy to set at first, but they are sometimes more difficult to latch for subsequent uses, but I've used mine over and over. Have you had success ridding your home of mice? I'm pinning this to my Things You Really Need to Know Board. @ Emma: Well fed cats do tend to look at mice as fun toys and not food, or something to kill, unfortunately. We had some mice as well, and I think we got rid of them. If they come back, I'll get some of these traps. Yes, this is one I have got to share... Sure this will raise a few eye brows, after all who doesn't need a good mouse trap from time to time, especially this time of year when they come indoors to stay warm and survive. Thank you Katie for the visit and comment. Cute and adorable as babies, the red squirrel can grow up to be a huge pest around the home.